The next 15 years will be vital in determining whether global warming can be limited to 2C (3.6F) by 2100, with energy and transport presenting the heftiest challenges, according to a draft UN report. "Delaying mitigation through 2030 will increase the challenges.... and reduce the options," warns a summary of the report seen by AFP. The draft is the third volume in a long-awaited trilogy by the Intergovernmental Panel on Climate Change (IPCC), a Nobel-winning group of scientists. 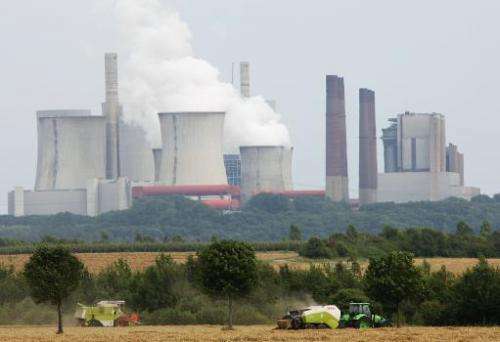 Major efforts are needed to brake the growth in carbon emissions for a good chance to limit warming to 2 degrees Celsius (3.6 degrees Fahrenheit) by 2100, says the summary. "(It) would entail global consumption losses of one to four percent in 2030, two to six percent in 2050 and two to 12 percent in 2100," the 29-page summary says. These costs do not factor in benefits, such as growth in new areas of the economy, or savings from avoiding some of the worst impacts of climate change. The estimates are based on the assumption that "all countries of the world" begin curbing carbon emissions immediately and that there are "well-functioning markets" to establish a single global price for carbon. The report looks at options, but makes no recommendations, for mitigating greenhouse gases that are driving the climate-change crisis by trapping solar heat and warming Earth's surface. The final version of the document is due to be thrashed out at a meeting in Berlin in April. 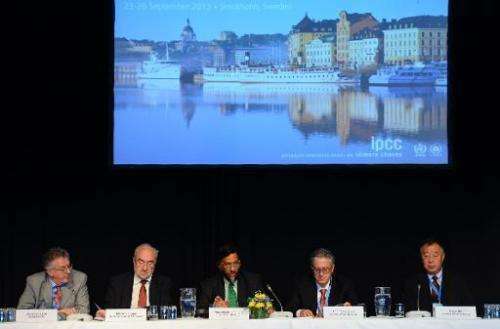 The trilogy is the IPCC's long-awaited Fifth Assessment Report, the first great overview of the causes and effects of global warming, and options for dealing with it, since 2007. The draft document notes that global emissions of greenhouse gases surged by an average 2.2 percent per year between 2000 and 2010, compared to 1.3 percent per year over the entire 30-year period between 1970 and 2000. "The global economic crisis 2007-2008 has temporarily reduced emissions but not changed the trend," it says. Members of the UN, in global negotiations, have endorsed the goal of limiting warming over pre-industrial levels to 2C, but not set a date for achieving it. Some experts say that on current trends, warming by 2100 could be 4C (7.2F) or higher, spelling drought, flood, storms and hunger for millions. Over the past decade, more than three-quarters of the annual increase in greenhouse gas emissions came from energy (47 percent) and industry (30 percent), led in particular by activity in emerging giant economies, says the summary. Emissions from the energy supply sector are on track to almost double or even triple by 2050 compared to 2010, unless there are major changes. These include gains in efficiency, a bigger switch to renewables or—provided obstacles can be overcome—widening the use of bio-energy and carbon capture at power plants. A similar warning is sounded for transport, where CO2 emissions could double by 2050 from 2010 without changes to fuel consumption patterns. An increase in the average temperature of the earth's atmosphere, especially a sustained increase sufficient to cause climatic change." So what "global warming" are they talking about? So all the past records of global temperature is BS? Or are you just a science hater? He's a science hater. His only comments on any article are that it is BS. Where did you achieve any sort of education in Science, especially properties of gases, heat flow & all the subsidiary training climate scientists achieve all over the world ? a moderate intelligence to be able to deal with combinatorial complexity. continue to rise that the heat must be going somewhere - doh also Latent heat of fusion. There is a tremendous amount of ice close to 0 deg C, which melts, this absorbs heat with no temp rise - doh ! This is the link you need to STUDY & have been told about it before, why do you stubbornly refuse to understand it yet quote other links from the same site - are you mentally incapable ? You ubavontuba, come across as somewhat retarded, ie Not able to read, not able to understand, no recollection & complete inability to consider consequences & even consider a BASIC experiment in your kitchen re HEAT ! What do you do ubavontuba, other than waste your OWN time with complaints and STILL take no effort to think & get an education ? What do you imagine you are achieving ? Here, you're just trying to redifine the term. If you doubt my definition, look it up yourself. Pie-in-the-sky. You present no evidence, but insist "heat must" which simply shows you "believe" in this heat and that it "must" be doing something. For one, I'm obviously enetertaining myself, at your expense. heat with no temp rise - doh ! If the next 15 years are critical, then we are out of luck. Nothing about human behavior changes that quickly unless the danger is here and now. With the accelerated industrialization of Asia, the use of fossil fuels is only going to increase for the next several decades. It is only through the appearance of a fuel source that can compete with oil derivatives on an economic footing that we will slow our CO2 pollution. Fortunately there is a finite supply of oil and supply and demand will drive us to solutions. If the next 15 years are like the last 15 years, there will be no warming. Most here cannot handle the truth. You can SEE the politicians eyes bug out at the prospect of all that tax money. I see it as more of a power grab by the EU, as most of the major climate complaints are powered by either the EU, or by "up and coming" nations who just want to gripe because they weren't the first to modernize or develop modern infrastructure; namely some S. America and African nations. The EU would love it if the U.S. crippled itself by heavily restricting CO2 production. Well assumption #1 isn't happening anytime soon and #2 isn't happening a all. Good luck. In other words we need a reduction of fossil fuels of 22 percent by 2100. The U.S. has to reduce it's CO2 production or risk being a bad neighbor in the world's eyes. China will soon surpass the US in CO2 reduction even with it's amazing (but unsustainable) growth as it goes green. Everybody buy a Tesla. Install photovoltaic panels on your garage roof for use as your charging station. Mine's on order, I'm getting the Model X SUV with the long range battery about the end of this year. By the way I own Tesla stock & that company they refer you to for solar panels. Your tongue-n-cheek quip trying to mock green energy just demonstrates more ignorance. Eventually solar will be the only viable energy source because mankind will be extinct, just like the dodo bird. The UN is correct, the next 15 years are critical for mankind's survival otherwise we face doom. Howhot - Of course humans will one day become extinct just as all species do. However, unless there is a meteor that wipes us out, we are here to stay for a long time. We have a finite supply of oil that we can burn. Eventually we will burn it all and be forced to use a cleaner source of energy. The damage that we have done will correct itself. Someday we will explore the stars. Our odds of survival will increase as we spread out. We will be around for a very long time. Howhot - Of course humans will one day become extinct just as all species do. However, unless there is a meteor that wipes us out, we are here to stay for a long time. I disagree. Nothing indicates the survival of mankind for the next 100 years from now is certain. Nothing. Obviously we all live with the possibility that a meteor can wipe out humanity. However, that is not the point. The point is we are destroying our own world with CO2 and deniers do not agree. To say deniers do not agree, minimizes the issue. The issues are extreme. The issues have consequences. The issues will have an effect on human's existence. The issues are well defined. Get rid of excess CO2 or human existence will fade into a Soylent Green. an increase in the earth's average atmospheric temperature that causes corresponding changes in climate and that may result from the greenhouse effect. you HAD to know I would find you, right? Global warming stopped 12 – 16 years ago. Sounds vaguely familiar... Oh, RIGHT! why do you keep posting the same, tired argument that has been refuted, Uba? you see where I am going, right? if ANYTHING, YOU are hiding from the truth! comment with no evidence = what, really? at least Uba joins in the fight and posts links to her comments! The point is we are destroying our own world with CO2 and deniers do not agree. You must not get out much. Close your laptop and go immediately to the nearest national park. Natural beauty abounds, and awaits! Deliberately quoting out of context to pretend it's the other guy, when the trolling behaviour is your established pattern, does much to confirm the assertion that countering your stubbornly-continued malarkey is akin to playing Whackamole. How's it out of context when that was his message in its entirety? In his Dec. 10, 2007 "Earth has a fever" speech, Gore referred to a prediction by U.S. climate scientist Wieslaw Maslowski that the Arctic's summer ice could "completely disappear" by 2013 due to global warming caused by carbon emissions. Wait a sec.... I'm sorry everyone.... Global warming caused the ice to grow in the arctic. All the glaciers that are growing is caused by Global warming. All the record cold weather we are having is caused by Global warming. Even thought the temperature of the earth has not risen, that too is proof of and a cause of Global warming. The idiots who voted for Obama twice was caused by Global warming. Obama care disaster, where more people lost health care than who gained health care, where health care costs rose instead of decreased.... that too was because of Global warming. "Whack-a-mole" is not an argument, but rather a petulant retort. Therefore Maggnus is embodying the very definition of an internet troll. This is a science site. If he has a disagreement with the science I presented, then he needs to explain this disagreement, in context. Bullying and name-calling are childish. And personally, I think Maggnus presents some good and interesting insights at times. It's a shame he debases himself so. when you refuse to acknowledge reality, what is left but to result to comical retort, satire and hyperbole in order to elicit emotional responses due to your lack of functional grasp of the argument, let alone the rest of the situation? "Whack-a-mole" is not an argument, but rather a petulant retort. No Ubamoron, it is the response to the game you play. Therefore Maggnus is embodying the very definition of an internet troll. No, Ubamoron, I am responding to your game. This is a science site. I agree. You should try employing some. If he has disagreement with the science I presented, then he needs to explain this disagreement, in context. Bullying and name-calling are childish. What science? The zombie arguments you continually repost have been dealt with many times. You just childishly repost them to the very next article. You know dumdum, people actually follow these degenerate discussions. Those who have seen your ongoing psychotic babbling understand the game "whack-a-mole'. Who do you think you fool? B.S., you're the one avoiding data. So why is it so difficult for you to discuss just the last 16 years? This definitely seems to be an AGWite characteristic. Imagine if folks lived as if the last 16 years of their lives simply didn't exist. Wouldn't you think they're a bit wacky? what is left but to result to comical retort, satire and hyperbole in order to elicit emotional responses due to your lack of functional grasp of the argument, let alone the rest of the situation? And now you just openly admitted you're an internet troll. Figures. So are you suggesting the global temperature records of the last 16 years aren't science? but i guess you ignored that... better and easier for you to argue with. and so you repeat yourself again, only proving what i said earlier. Trolls repeat time and again with no regard for logic. maybe he is suggesting that culling data to prove a false assumption is not science. Maybe he is suggesting, like I did, that if you include the past data (as I showed you already), that you cannot make the ASSUMPTION that global warming has stopped. and this is not TROLL behavior? Which any sane and honest person would have to admit is not the same thing as discussing just the last 16 years. Ergo, you're insane, or patently dishonest, or both. any other names you would like to call me? Which is not discussing just the last 16 years, now is it? Which isn't using just "my data," now is it? What's happening now is most relevant. So you think closing your eyes for a time will just make it go away? So maybe you think the time to apply the paddles is when the patient is in his coffin? who said i was closing my eyes? addressing the situation means researching the causes and knowing how to fix the problems, therefore what is going on now by scientists is helping the situation. But how do you know when it's time to use the paddles, maybe you think by looking at data from yesterday? And as I pointed out in the other thread, scientists are addressing the pause. Data is data, and it's all relevant in its context. This is you avoiding the truth. No, not in the way you are trying to portray. You take one line of research, consisting of data you have cherry picked to show the short-term, incomplete, inaccurate trend that you think supports your position, while ignoring thousands of data points from a whole range of disciplines, all of which support the premise that the globe is warming, then try to make others believe in your flawed attempt to obfuscate the science by posting the same short-term, incomplete, inaccurate graph to every single discussion you have on every single thread you post on. Your graph is not relevant! What is happening now IS relevant Uba, which you would realize if you could just take the time to try to comprehend the whole of the data, not just your one cherry-picked graph. Why can't you discuss the whole picture Uba? Why are you so fixated on that one data set? I have, and am quite willing at any time. What do you suggest? Because it's current and now, and it's in violation of the expected. Aren't these the very criteria where true science opportunities exist? And why aren't you celebrating the hiatus? If you abhor warming and abhor a hiatus, are you for cooling then, perhaps into a new iceage? First I suggest reading up on critical thinking. Then I would suggest you start by going back to read many of your own cites, only shake off your denialist mindset and actually work to comprehend what the researchers are saying. Stop fixating on the quibbling bits and look at the whole picture. Release your desire to see politics where there are none, and focus on what the researchers are saying. and it's in violation of the expected. and that's because the data is cherry picked. It is not reflective of the whole, nor is it reality. Aren't these the very criteria where true science opportunities exist? And why aren't you celebrating the hiatus? If you abhor warming and abhor a hiatus, are you for cooling then, perhaps into a new iceage? First I suggest reading up on critical thinking. LOL, you obviously don't even know what this is. Then I would suggest you start by going back to read many of your own cites, only shake off your denialist mindset and actually work to comprehend what the researchers are saying. Stop fixating on the quibbling bits and look at the whole picture. Release your desire to see politics where there are none, and focus on what the researchers are saying. LOL. You're confusing conventional thinking with critical thinking. And why are you trying to tell me what to think, instead of "discussing the whole picture" as was the topic and context? How can it be false, when it's real data? B.S. It represents the real and current trend, going back 16+ years. Denying this is denying the science. I guess you don't know much about science then. Idiot. You're the one excluding the middle!